Milford High School was recognized on the Fourth Annual Advanced Placement (AP) Honor Roll, which is sponsored by the College Board. We are one of 477 schools in the U.S. and Canada to be named to the Honor Roll, and one of only 37 districts out of over 600 in the state to receive this honor. Districts are named to the Honor Roll for increase access to AP coursework while also increasing the percent of students earning a three or higher on the tests. This means that not only are more students taking the tests, but they are successful in earning college credit at many colleges for their scores. Success in AP classes is an early indicator of success in college. Congratulations to our students and staff! The district’s financials continue on track. A $1,000 donation was received from Melisa and Dave Fossier or the Natalie Fossier Memorial for the Anti-Bullying Program at the high school. Thank you for your generous support! The board approved new policies regarding tobacco and nicotine use by students and also on district property in general. Any type of nicotine product, as well as items that are “look alikes” and may not contain nicotine (such as vapor pens) is not permitted. In addition, smoking and nicotine are not permitted on any part of district property. This is a change from the previous policy, that set aside a designated smoking area. Milford’s Nutrition Services department was approved to participate in the “Cook for America” program sponsored by Interact for Health. This is a grant to train our cooks to cook for the large number of students they serve from scratch, starting with raw food. The goal is to continue to improve our ability to deliver high quality food that meets federal and state regulations, that kids also enjoy eating. We will be participating with the Norwood and Erlanger Elsmere Independent school districts. I am particularly excited about this opportunity as I would like to see the district provide as much freshly-prepared food as possible. The school board said goodbye to Debbie Marques, whose term ends on December 31. Debbie has served on the board for the past eight years, through some tumultuous times. She has seen and contributed to many changes over those years, and leaves the school district a much better place than when she joined the board. Thank you for your service, Debbie! The Freshman Choir and the Show Choir performed their Winter Concert on Dec. 16. Tri-State Productions recorded a DVD of the show which can be ordered from their website. Milford Photography Club recently completed a service activity by taking portraits for 2 families experiencing homelessness. Photography Club will be completing a similar activity for Men in the Talbert house for Fathers’ Day. The Milford New Voices program was invited to present at the 25th National Service Learning Conference in Washington DC, in April. Twenty-four MHS students’ work will be shared with a national audience and their stories and experiences will be used as a best practices program for service learning experiences. Two student representatives will be presenting along with MHS Art Teacher Janelle Schunk and program director David Rosenthal. Milford is the only Cincinnati school presenting at the conference. We are very excited and proud of our students’ achievement! Key Club organized a club school supply drive for Faces Without Places, volunteered at the annual Faces Without Places Chili Taste Off where they helped raise $4,100, and volunteered their time at the Holiday Carnival & Shop at Seipelt. MMT Drug-Free Coalition continues a variety of activities after exam week. Ski Club is scheduled to start Thurs. Jan. 9 and new activities are on the horizon including Anime and Archery. Come out and support our students! It’s an exciting time to be an Eagle! The Winter Season for the Eagles is off to great start! In Boys Basketball, Milford’s early 2-1 record leads the ECC. The Eagles are 4-1 overall and picked up a key win over Loveland on Tuesday. They take on Kings this Friday at home at 7:30 pm. The Girls Basketball team is currently ranked 2nd in the ECC with a 3-1 record. They travel to Hughes HS this Saturday. Wrestling garnered two recent ECC wins over Kings and Anderson in a home tri-match. The Eagles travel to Harrison this weekend for the Coaches Classic. Swimming traveled to Anderson last night but fell to the Redskins in only the first loss of season for the boys’ side. The Dive team got their highest scores of the year so far against Anderson last night. The Boys Bowling team (2-3 ECC, 5-5 overall) took on Anderson today at 3:30 at Eastgate Lanes. The Lady Eagles Bowling team (4-1 ECC, 7-3 overall) also battled Anderson today to maintain their ECC position, trailing only to Glen Este. Academic Quiz team started the season off strong defeating Winton Woods, but they were unable to get past Walnut Hills. They’ll continue to prepare as they head into the New Year taking on Kings after the break. The Milford school district is excited to announce that, in conjunction with Cincinnati Public Schools, we have been awarded a $1.1 million grant for the Partnership for Innovation in Education (PIE), Smarter Schools, the Mayerson Academy and the NKU Center for Applied Informatics to implement case-based, experiential STEM programs for elementary students. This is part of the Ohio Department of Education’s Straight A Fund, which set aside $250 million for Ohio schools to explore new ways of delivering education. Milford began its relationship with PIE about 4 years ago, when I joined PIE’s Board of Trustees. The organization is dedicated to finding innovative new approaches to delivering education and engaging students, as well as communicating new approaches to stakeholders. PIE’s CEO, Mary Schlueter, has been having ongoing discussions with Dr. Farrell about how the two organizations can work together. PIE has been focused on piloting a program with Cincinnati Public’s Kilgour Elementary in Hyde Park, where teachers worked with PIE to use a case study approach, such as that used by business schools, to enhance teaching STEM (Science, Technology, Engineering, Mathematics) skills at an elementary level. The case study method places the student in a decision-making role, where facts and context are presented, but students must actively pursue a solution. The program at Kilgour was highly successful, with the school becoming the first public elementary to launch an app available globally via the Google Android store. Every $.99 download of the Cash Cow Lemon SmashTM app provides revenue to Cincinnati Public Schools. Milford’s goal is to work with a local company focused on the physical sciences to identify a need sixth graders can address through this same approach, under the guidance of the organizations listed above. The specifics of the program are still in the development phase, but Milford will work on its own problem that dovetails what our students are learning. The Milford school district does not pursue any grant simply for the sake of receiving “free money.” We vet all grant opportunities to be sure they make sense for our students and staff and also do not put us in a situation of having to add significant expense when the grant is over. When PIE approached us about partnering for this grant, the administration did their due diligence and identified how this program would make a lot of sense for our students. We are excited about the possibilities of this grant to develop more effective and engaging teaching methods for our students. This month, due to personal commitments, I resigned from PIE’s Board of Trustees. However, I’m excited to say Mary Schlueter has asked me to remain on the Advisory Board, so I will still be closely involved with the organization and look forward to a great relationship between PIE and Milford Schools. For more information: Straight A fund grant press release. Prior to the December 29 school board meeting, the board held a public forum to discuss changes to next year’s school calendar, required by the House passing House Bill 59, which changes required school attendance to hours instead of days. The current calendar was developed based on the “days” concept. The change to hours allows us: 1) more flexibility to provide better professional development to our staff; 2) to account for calamity days within the school year; and 3) requires us to look at kindergarten and senior hours to be sure we are meeting requirements. The calendar will be voted on in January. Under the proposed calendar, school will start for students on Tuesday, August 19, with the last day being Friday, May 22. There are slightly more hours than last year’s calendar, which meets student needs, staff evaluation needs, and parental expectations. School is starting early to allow students time to complete curriculum objectives before testing. 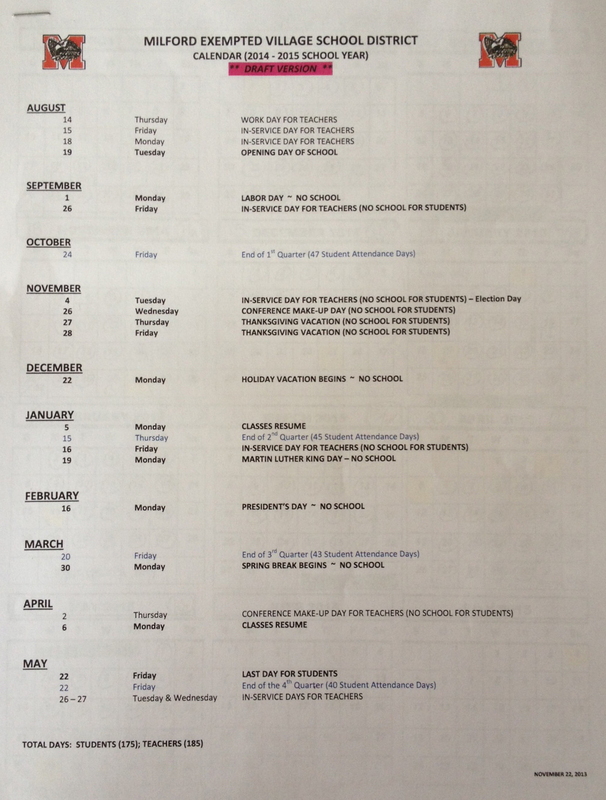 The calendar moves from the previous early dismissals for staff development to two full development days during the year (September and November). In addition, an in-service day between the first and second semester (January – Martin Luther King Day weekend) has been added. Kindergarten will be increased from 2 hours, 40 minutes to 2 hours, 50 minutes to provide enough extra hours to cover for calamity days. The practice of allowing seniors to have early dismissal will be discontinued because they will otherwise be short on hours for the year. However, seniors who could be approved for early dismissal will have the option of supervised activities and approved educational options (still under development). This calendar has the first semester ending in January, as has been done for years. High school exams thus take place shortly after the two-week holiday break. Board member Debbie Marques raised this an issue she has heard from parents: having exams after break does not allow students to rest and recover during their time off. Two parents also spoke to the board about this issue. I agree this is an issue. Other districts, even if they have the semester end in January, hold exams before break. At least one area district has used the calendar change and testing schedule to move school start up to the point where the semester will actually end before winter break. Assistant Superintendent Tim Ackermann, who was running the hearing in Dr. Farrell’s absence, says the administration will take this concern into account in looking at a new draft of the calendar before January. See the draft of the calendar below, and please feel free to get in touch with any questions.